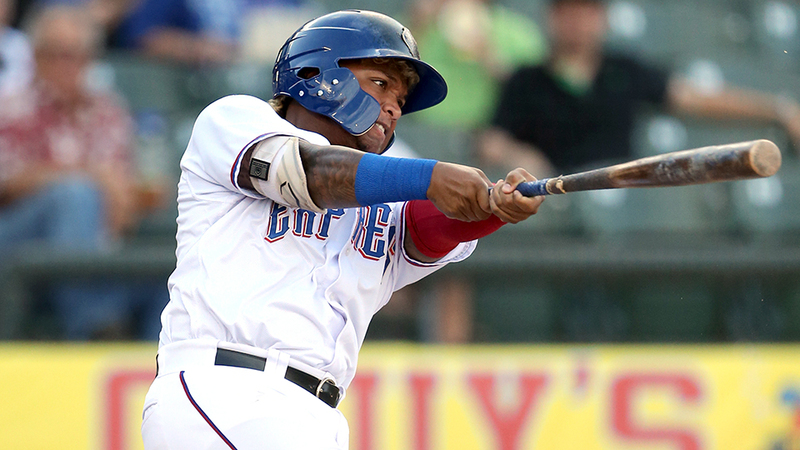 Willie Calhoun was extremely disappointed to learn that he would be returning to Triple-A Round Rock after finishing last season in the Major Leagues. "I was really mad, just because I felt like I had nothing else to prove here at Triple-A," the Rangers' second-ranked prospect said. "When you hear that you're going back to a league after you had such a good year like that ... I just kind of felt like it was a slap in the face." Calhoun admitted that his frustrations got the better of him as he did not get off to a roaring start in his second turn in the Pacific Coast League. But he seemed to turn the corner Saturday night. The 24-year-old singled three times and drove in three runs as the Express outslugged Colorado Springs, 8-6, at Security Service Field. Calhoun entered the game with seven hits, two for extra bases, and one RBI in his first 34 at-bats. "If I believe in myself, that's all that really matters," he said. "Just because the first week I was kind of mentally not all there I was just really upset with how things had been going. ... But two nights ago, I feel like I really started to settle back in and forget about it and not really worry ... and just kind of play my own game." MLB.com's No. 53 overall prospect landed with Texas as part of the deal that sent right-hander Yu Darvish to the Dodgers at last year's Trade Deadline. He played 99 games with Oklahoma City before the trade and finished with a .300/.355 /.572 slash line, 31 homers and 93 RBIs before earning his first Major League promotion. The 24-year-old went 9-for-34 (.265) with a homer and four RBIs in 13 games with the Rangers. On Saturday, Calhoun flied to left against second-ranked Brewers prospect Corbin Burnes for the last out of the opening inning. With the bases loaded and nobody out in the third, he smacked a base hit to left on a 3-2 pitch to score two runs. He was cut down at the plate later in the inning after Christian Lopes bounced into a forceout. "It definitely gives you confidence to build off that," the California native said. Calhoun skied to left to start the fifth but dropped a bunt single to lead off the seventh against reliever Tim Dillard. Veteran first baseman Tommy Joseph followed with a homer to left. The 2015 fourth-round pick again got a final turn at the plate with two outs and two on in the eighth and the score tied, 6-6. He returned a 2-1 offering from right-hander Erik Davis back through the middle for a base hit to score Jose Cardona with the go-ahead run. The three hits lifted Calhoun's April batting average to .279 through 193 at-bats in his Minor League career. He played in left field for the seventh time in eight games this season and said he's felt comfortable at the position. "I'm getting better every single day out there," said Calhoun, who played exclusively at second base until last season. "The more reps I get out there, the more comfortable I feel. And I'm really comfortable right now and I hope to keep that going." Calhoun's roommate, Destin Hood, who signed a Minor League deal with the Rangers in January after three seasons in the Marlins organization, ripped a pair of solo homers. "He's a tremendous guy to have in the lineup," Calhoun said. "He provides you with some big-time power. Last year, when I was with OKC, we always played against him and he always hit home runs and I was like, 'Who is this guy?'" Brewers No. 6 prospect Brett Phillips tripled, doubled and scored a run, while 11th-ranked Mauricio Dubon singled twice and scored for Colorado Springs.